I showed you how to make steamed dumplings in the previous recipe. In this post, I show you how to prepare a great meal to go with them. The dish is called Segedin goulash (Segedinský guláš) and it’s a stew consisting of pork and sauerkraut. You will find it offered in most Slovak restaurants. 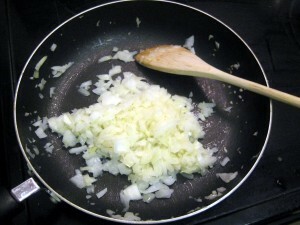 Chop up one medium onion (cibuľa), and brown it on butter (maslo). Add cubed pork (bravčovina), along with 1 teaspoon of paprika, half a teaspoon of caraway seeds (rasca), few dashes of black pepper (čierne korenie) and some salt. Fry stirring until pork is cooked on all sides. This will take about 20 minutes. 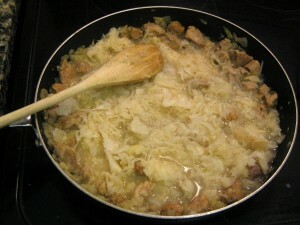 Now add 1 lb of sauerkraut (kyslá kapusta) and enough water to cover the concoction. Cover, and simmer for 80 minutes, adding more water as needed. 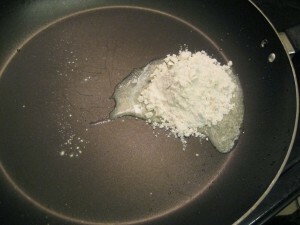 Take 3 tablespoons of flour (múka) and brown it on melted butter (or lard). Mix into the stew. This will thicken the sauce. Finally, stir in one cup of sour cream. Let boil for few minutes. Serve with dumplings. Enjoy! Visit this link for other goulash recipes. 58 comments - What do you think? sour and well cooked pork tasted great. Fantastic, I had this at a restaurant in NYC. Now i can make it at home. Might add in some beef and cooking wine. i am indian national living in slovakia with my husband and child. i live in banovce nad bebravou. your website is very good and informative. though i am a vegetarian,i have tasted slovak food like perana buchty,some cakes,cesnak polievka etc. i particularly like buchty and it would be great if you could post its recepie.one of my friend’s grandmother who lives in a village called Rybany makes awesome cakes and i had a chance to taste buchty there and i just loved it. if you want to know anything about indian cuisine you can feel free to ask me or mail me on the above mail id. Hi Rama, this is a funny coincidence. I was already planning to make buchty this weekend – filled with both cottage cheese and jam. Check back maybe on Monday? As far as Indian cuisine goes, one of my good friends is Indian, so I get to taste his home cooking on occasions. I am glad you are enjoying Slovak cuisine! we make buchty too. steamed dumpling with melted butter on top and sprinked with a mixture of icing and cocoa. 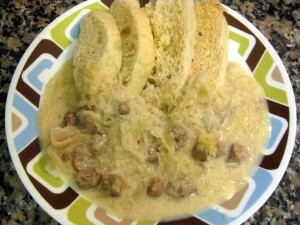 My partner and his family are slovakian and our children love this dish!! so do the adults! Hi Rama, I am a Slovak but living in the USA, and I am also vegetarian / vegan. I love making “veganized” versions of traditional Slovak meals. For example, today I made Segedin goulash with tempeh instead of pork, and cashew-cream based sour cream (simple recipe from the web). It was delicious! I also buy soy chicken/beef etc. – in the USA, big brands are Gardein, Tofurky, Beyond Meat, Vegetarian Plus and many others. European supermarkets have other brands but similar products. It’s a good way to enjoy the “meaty” Slovak dishes. Cheers! And thank you Lubos for recipes with pictures, it helps. I love Segedin Goulash, and I make it frequently. The problem I have is to make good “knedla” to go with it. If anybody has a good way how to make it and not screw up I am all ears. I am usually using pasta but it NOT the same!!! Cauko Miro, I’ve made knedla about 5 times now and it turned out fine every time (not as good as my grandma’s but good enough). I think the trick is: 1) let knedla sit for some 30 minutes after forming to let repuff 2) use a large pot and 3) do not take the lid off until cooked to keep from deflating. This looks delicious, and I will definitely be trying it! 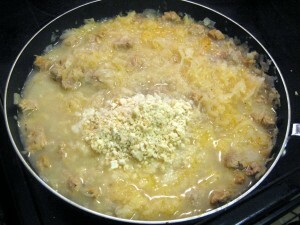 For those who ahve made it, do you find it necessary to rinse the sauerkraut at all, or not? I don’t rinse it, however I try to get most of “fermented water” out before I start cooking. If you use it the way you buy or make it, it my be overpowering . but I am not good at it, and I’ll try your suggestion. I guess it’s similar to “knedla in a cup”. I never made it but some friends swear to it, aka put all prepared dumpling dough to a cup and then steam it. oh well, I don’t know. Thank you for the information, Miro – I will try it your way! The dough must be fermented and must be boiled to steam in a covered pot. Hi Lubos, thank you for this recipe! I made it for dinner tonight and we loved it. Did you ever try to use crockpot for Segedinsky gulas? It’s the best. Miro, I make knedla quite often. 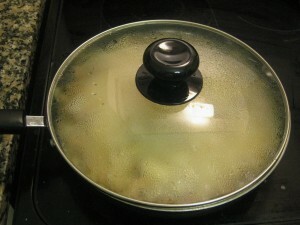 I use vegetable steamer insert inside big pot and steam it without opening lid. My first few times were unsuccesful(almost everything from yeast dough) but I think everytime it got better and better. I always make like 4-5 knedle at the time and the 2-3 put in the freezer. I am curious about crock pot version. Melania, do you put everything in there at once and cook for 6 or more hours? 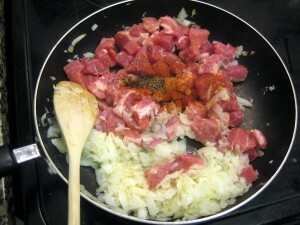 I saute onion, garlic first, then I brown meat. After that I put everything with sauerkraut and seasonnings in crock pot. Start with high and 30 min. later turn knob to low and cook 6 hrs. Mix milk and flour add to crock pot and cook 1 more hour. Sour cream goes last one after I turn crock pot off. 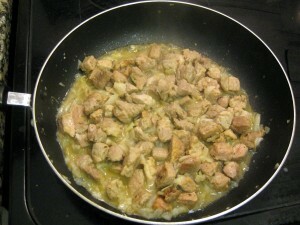 hi lubos.my mother was hungarian and she made it many times for us.i make it just like yours whit pork and it is yummy. es for knoedels i make semmelknoedels ore potato dumplings. Hi,thanks for all the great recipes.I am from Slovakia now living in UK.I am trying to cook Slovak food for my children.This site is a great inspiration when I am not sure what to cook. So tomorrow it’ll be segedinsky gulas. Just hope knedlik will turn ok.
Hi, thank you for a great recipes . Me and my husband -are slovaks. I like to cook slovak dishes. I got lots of recipes from my mom…and recently I found your web….which I looooove. Last week I baked makovy zavin a lekvarove buchty. They came out great. Now I’m cooking segedinsky gulas a knedle. I never had problem with knedle. All my familly just love it. Kids too.!!! In freezer department you can buy dough for white bread, Let defrost and cook in vegetable steamer for 20 min. Melania, which grocery store do you shop in? I’ve been looking for frozen dough in my local Giant but all I’ve found was the one for puff pastry. HELP! I have a Slovakian exchange student I am making a segadin recipe his mother sent me. The translation may be wrong, and even after skyping with her I am confused…she says to use “sweet whipping cream” not cream or sour cream. Could this be right?? P.S. Wish me luck on the dumplings-they are rising right now! Hi Tara, what exactly does the recipe say? You can copy and paste it if you want. The Slovak word for “cream” as in “whipping cream” is smotana. Sour cream is kyslá smotana. Anyway, good luck!! And take photos and post them on Facebook when done. Made this for my Slovak family yesterday – my first attempt ever at slovak cooking. I substituted the white flour in the knedlik for whole wheat and somehow the dough didn’t rise for me and knedlik came out very ‘heavy’ and ‘dense’. Can anyone give me tips on how to make it lighter and airier? The Segedin goulash turned out delicious – I followed the recipe exactly. My family loved the meal as they doused the knedlik with the sauce so you couldn’t tell that it wasn’t the best. Awesome and glad you liked it! So I have never tried making the dumplings with whole wheat flour, so I can’t quite comment. I have actually bought my first-ever bag of whole wheat flour just yesterday. I’ll use it tomorrow when making bread (I normally combine all-purpose with rye, but want to substitute wheat for all purpose). Anyway, I am not an expert on making dough. Making dough is one of those “art” aspects of cooking that you master only after many years of practice (so it seems). But what works the best for me is making smooth dough that is quite malleable, kind of having the consistency of thick honey. Definitely not something that you can actually form into a loaf. I then let the dough rise and only then work in just enough extra flour to make the actual loaf. Try this, it seems to work much better than starting with a dense loaf. I also tried to make the knedle with whole wheat flour which did not work well. However, I do make whole wheat bread know that you need to have half whole wheat flour and half all purpose flour. Here in the United States one can purchase flour that has already been blended 50/50. Just read the bag to see which whole wheat you have purchased. Nancy, this reminds me of my first attempt to make rye bread. I figured, alright, rye bread = 100% rye flour. Not so much. I ended up adding in some all purpose in the end just to actually coagulate the mass together, and it still ended up really dense (sort of like the German pumpernickel). Since then I’ve been using about 25% rye flour, 75% all purpose, and it’s been turning out fine. Next time I make it I’ll substitute wheat flour for all purpose. Or, from reading your comment, for part of all-purpose. I can’t wait to try this. Mom used to make a pork roast with the sauerkraut cooked in the drippings and then sour cream added, but I have never managed to make it taste right. I think this will be the ticket. 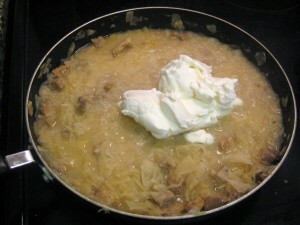 This is one of my favorite Slovak dishes. Definitely give it a try and let me know how it turned out. interesting – recipe seems awfully close to, if not identical to Székelykáposzta/Székelygulyás which is a traditional Hungarian dish. (Székelyföld is a region in Transylvania home to a group of ethnic Hungarians known as the Székely, or “Seklers”) I make it often, my family loves it but we put red paprika in it. thaaank you for all recipes, I’m Slovak but from time to time I need to check how to prepare my hudband’s favourite meals;) And I’m lucky to find your recipes because you are preparing it the same way as my mom and her mom…was doing it;) BTW it doesn’t matter if you use sour cream or some other cream. I use sour cream but if you use whipping cream it’s gonna be just a lit different.. Thanks so much for the recipe, will be trying both this weeks. Just had this gulas today for lunch in Nitra. It is excellent. Now I will have the receipe when I return to Pennsylvania. Thanks. After having this fantastic meal in Montreal, Canada at a Slovak Restaurant I have been scouring the internet in search for the recipe to make at home in Queens, NY. Finally settling on slovakcooking.com (!) I went out and bought what I needed and following your recipe the dish came out better than what I had in Canada and better than I expected! I did a bit of experimenting with Sauerkraut brands and found Sliver Floss Krrrrispy Kraut to be the best of what I could find in a NYC supermarket. Thank you so much for your recipes! Awesome! But yeah, once you start cooking, you realize just how much better anything home made tastes. Hello…I’m thinking of making this for Christmas Eve dinner here in western Canada. Could you tell me how many people this recipe will serve? I’m having 9 guests total. for 9 people I would double the size on all ingredients, and if you have some finicky eaters, not eating much, don’t worry, it gets better when you reheat the leftovers. You can start with pork, double the size of main ingredient and make is 3 lb or 48 ounces, divided by 9 = 5 ounce per person which is a typical serving when combined with other ingredients. Correct is Segedínsky or Szegedínsky! I highly recommend preparing this ahead of time, as the flavor and texture dramatically improve after a cycle of storage in the fridge and reheating in a pan, bringing to a boil. Be sure to not overcrowd the pan during browning. It would be easy to season and prepare two single batches simultaneously in two pans and then combine them in a large pot when you add the sauerkraut. Thanks Tchors and Miro. I’m making it this Friday to serve on Christmas eve. Can’t wait. Am making dumplings too but am a bit more nervous about making those – hope they turn out! Matyas….I’m sorry but Szekelygulyas is prepared that way. No it’s not a soup but just look in any hungarian cookbook. This food is székelykáposzta,the székelys live in west Romania,Erdély(Transylvania),far away from Szeged. I’ve made this – my recipe was very slightly different due to regional or family differences, but essentially the very same thing. I love this type of gulyas because it breaks ALL of the gulyas “rules” that you hear about – yet it is wonderful stuff and very easy to make. As we enter this “comfort-food” time of year, I would encourage all to try this. It is easy, as you can see, and delicious, as you will taste! Great dish! Made this for the family, and they were surprised they loved it – worth the heavenly sauerkraut aromas in all. It was fun to make and delicious enough to fight over in the end. The onions and up almost liquefy in, like magic. . .
Roblox lets for the creation of groups.